"Mom Midnight is right, i do think you are spend to much time with the pups then me!" Jessie said still banging her head on a rock. "Mom why don't you just hang out with the pups and pack instead of me you are to busy caring about how cute they are!" Jessie said that when she banged her head on the rock she broke it. Pheonix arrived at the den and glanced at Jesse and Cat, then walked to Jessie, who was banging her head on a rock. He quickly put his paw on Jessie's forehead, stopping her. "Your mother is just interested in Karsy's pups. She doesn't mean that she loves them more than you" Pheonix remarked, keeping his voice calm. He noticed a large moss ball in the den. The male walked to the den and grasped the mossball in his jaws and brang it to Jessie. He pawed it over to her, motioning to go play with it. Pheonix smiled and walked into the den. Anabell was sleeping in her mother's paws. She can't wait to open eyes for first time and see the world sniff it also. But she didn't really know that the growling migh be hard. "Your just as cute as all those pups!" she cried, running over to Jessie. "Just because I don't spend every minute of every day with you, doesn't mean I don't care about you." The female licked to blood of her pup's face. 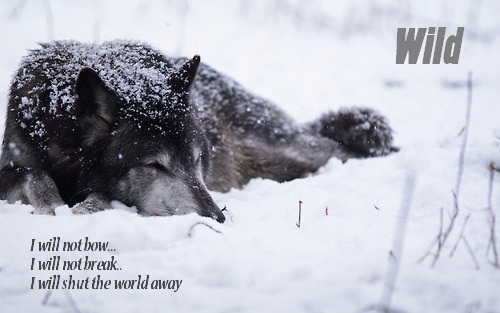 Wild and Midnight both decide to step back and let them be alone. "I don't care and stop licking me I'm fine!" jessie said walking to the pups. "You make me sick." jessie told the pups softly. Jessie left the pack and went to the waterfall. She found blood on her forhead and licked it. "My family tries to cheer me up but they can't!" Jessie said to herself. "Cat really forgive about me and my pups. They aren't important now. Go say Jessie you don't care for the pups." Karsy said to Cat. She wanted everyone to feel good and be happy. No one haves to be ignored. Karsy sat dawn pups were sleeping in her paws. "No." Cat said. "She needs to learn that she isn't the center of the world." She made sure to speak loud enough for Jessie to hear. Deep inside she wanted to tell her that she was going to always be the center of attention, but that wouldn't teach her a thing. Jessie didn't listen she was to busy killing ugs she found from a log. "I hate the world and my life." Jessie said to her self. She killed all the bugs and then she started scratching the tree like she was angry at it and if it where the pups. Blake was worried. "Jessie just forgive about the pups. They cannot take Cats love away from you". He went to Karsy and sat dawn. Blake said "Now you two say to each other what you feel. Me Karsy and the pups will leave you alone". He hopes that they make up each other. Blake picked up Karsy and the pups taking them away. Now Cat and Jessie have to fix up. "Come on you two. Jessie you know that Cat doesn't love the pups more than you, so fix up each other" he said leaving them alone to talk and say what they really feel. He walked away from the den in a forest. Tomorrow he will hunt, he wished some of the yearlings to become a hunter so to help Blake with the hunt. There was much time for this. "Hey Pheonix long time no see." he turned back at Pheonix smiling. Bolt was happy to see his friend again. "You can't be jealous and have temper tantrums like this anymore." Cat said looking down on Jessie. "You even said it yourself, you're getting older. You need to understand that nothing in the whole world is going to make me care any less about you." The female lied down, so she was eye level with her pup. She thought in her head about how bad of a parent she was, but tried not to show it in her face. Wild stepped away going over to Bolt and Phoenix. "Yeah, Phoenix! Where've you been?" he butted in curiously. Midnight followed the pack to leave the mother and daughter alone. She walked closer to Fang, who she trusted the most. The rest of pack was still a mystery to her. Karsy felt how Blake picked her up with the pups. She hopes that if Cat and Jessie are alone they will make up each other. She told Blake to put her dawn on the rock. Karsy laid on the rock and sattled the pups. Pink barked and ran around happily, exploring and play-fighting with her siblings. "IT'S SO AWESOME TO BE ALIVE! I love this world!" She walks over and starts to play with mom's tail and ears. Jessie gave Cat a serieuse look and i deadly look in the eyes. "Why do i always get in talks with aduits." Jessie whispered to her-self. She closed her eyes real shut and yelled "I don't care! You may be my friend but your not my Mother!" Jessie ran off to the lake hunted fish and when she hunted it she rip its guts out. Jessie was real steamed. "Ah!" jessie got so angry and steamed she lied down and ate dead fish. Ally spined around and fell on her mother. Laughed and lied down next to her mother. Ally didn't have much to say she just lied down and said nothing. Blake saw Jessie. "Cammon Jessie Cat loves you more than anything here. " he said. Blake was.worried bit then tough to self "Uh i will just leave them. They will make up each other sooner or later". He took Karsy and the pups back at the den. Karsy licked her pups gently. She lied dawn watching the pups sleep. They were so little. Karsy smiled at Blake and went alseep. She was still weak and tired, tomorrow she will be better. "So Pheonix were have you been. You're gone since we got back from time traveling?" he asked really wanting to know where he been. When said time traveling remembered all the adventures who aren't so in the past of the pack. He sat next to Pheonix and Wild. Anabellwas laying with her sisters on mothers belly. She was hungry so gone milk drinking. Anabell was exited for the moment she will have a look at the big world surounding her. Then felt asleep dreaming when she's older. She was one day old now. Fang went over to Cat and Jessie. "Hey Cat could I talk to Jessie alone for a minute? I think I can help her." she asked cautiously. Fang thought about Jessie's life and hers for a moment. The two lives were different, but were also the same. She knew how Jessie felt right now because it was like her whole life. Fang looked at Cat's reaction when she heard the question. She waited patiently for a response. "Sure Fang." she said, being sure not to look at the pups. She doubted fang would be able to do anything, but it was cute that she was trying. Wild kept looking at Phoenix, waiting for a reply. Midnight sat down awkwardly, with Fang gone with Jessie she felt alone. She then decided to go over to the group of males, though she didn't quite know what they were talking about. "Thank you." Fang said calm. She thought of what to say to Jessie. "I know how you feel right now..." she started out. " When I was about your age, my little brother was born. So my parents were always around him. I also got jealous like you did, but then I realized that my parents loved me just as much as him. And a week later, everything was back to normal. So what I'm trying to say is just because Cat was into the pups doesn't mean that she doesn't love or care about you any less." she told Jessie. Fang thought that what she said really went into Jessie's mind because there was a long pause. She just waited patiently for a reply. Bolt stared at Pheonix "Uh what's wrong with you. He ran away. Bolt whats going on with Pheonix he is.like a phantom. He gone to hunt something for the pack. Bolt just wants to know where have he been. Then shook head of. He hunted elk and returned to the den putting it dawn. Bolt was wondering for Ujurak also. Blake laid next to Karsy and their pups. He felt asleep next to her. Cat lied down, trying to forget about the world around her. For a second it worked. She lost sight of Jessie, who was now a whole year old and Fang and Midnight who were growing up right before her eyes. She forgot about the mystery about what had happened to Phoenix and Ujurak after we got back from the future. For a second she just lied there before it all came flooding back in her mind.